Prominent & Leading Manufacturer from Pune, we offer direct drive vacuum pump, rotary piston pump, belt driven vacuum pump, diaphragm vacuum pumps, dry screw pump and vacuum booster pump. Direct Drive, Oil-Sealed, Rotary High Vacuum Pumps are compact in size, as they are directly mounted on the motor flange. 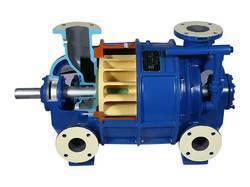 These pumps are light weight, well balanced and have exceptional size to performance ratio. These pumps have high pumping speeds and high water-vapor tolerance. The oil consumption is extremely low and they are air cooled. These pumps are used extensively in industry and laboratories for production of medium and high vacuum. They are used as backing pumps in series with roots blowers, diffusion pumps etc. These pumps find applications in vacuum coating, molecular distillation, vacuum metallurgy, freeze drying, vacuum impregnation, air conditioning and refrigeration, vacuum lifting devices, packaging machines etc. The rotary piston vacuum pump has become the major workhorse for a number of vacuum applications where relatively large chamber volumes have to be evacuated, where there is a large volume of outgassing from chamber walls or the process product or when the process has a high gas throughput due to gas being fed into the process chamber. They are excellent if the process requires a vacuum range between a few mm Hg (also called torr after Mr. Torricelli) down to about 50 microns. 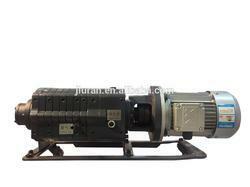 The pumps are generally rated to give an ultimate vacuum of 10 microns. (1 micron = 1/1000th of 1 mm Hg) Remember that the vacuum level in the process chamber will always be higher than the ultimate or blank-off vacuum at the pump inlet. In the heat treating and vacuum furnace industry rotary piston vacuum pumps are still an economical choice for many applications. The basic pumping capacity is often 150 cfm or 300 cfm and either size can be combined with a Roots design blower on the inlet side to give a variety of higher pumping speeds (and higher vacuum) depending on the pumping speed of the Roots blower. Also, the pumps are relatively easy to maintain or service by either in-house maintenance crews, local third party service shops or by the pump manufacturer depending on the ability or choice of the user. A number of vacuum pump industry companies have the ability to manufacture and sell the basic piston, piston sleeve and hinge bars for this type of pump. We are offering these in wide range of specifications in order to meet the diverse requirement of the industry. These are widely used in several industries like packaging, filtration, distillation, evacuation and several others. These are belt driven and are based on advanced technology. Our competent team uses premium grade raw materials along with imported components while developing our products. Owing to modern technology, these run on low power and require minimum maintenance. Moreover, these are specially developed to offer interrupted operation over a long duration. The interested clients should contact us to get our products. 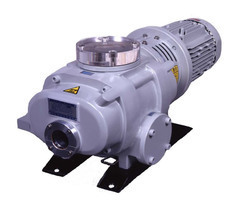 Being noteworthy Belt Driven Rotary Vane High Vacuum Pumps suppliers, we are offering our products at reasonable rates. We are capable of entertaining requirements of international markets. We are committed to deliver your consignment in stipulated time frame. Two parallel bearing-supported, intermeshing screw rotors (3) having opposite threads synchronously and contactlessly counter-rotate in a cylindrical housing (2) that tightly encloses them, and together form a multi-stage pump. Because of the counter-mesh of the two rotors, the volumes sealed in each thread are advanced along the rotors to the outlet (4). The pump has no valves at either the inlet (1) or the outlet. When a displacement volume reaches the outlet opening, the pressure is equalized with the atmosphere. This means that atmospheric air flows into the displacement volume and is then discharged again as the rotor turns. This pulsing gas flow generates a high level of dissipated energy and heats the pump. The dissipated energy can be minimized by means of internal compression. This internal compression is achieved by reducing the thread pitch in the direction of the outlet. The gaps between the housing and the rotors, as well as between the rotors relative to one another, determine the ultimate pressure which a screw pump can attain. The geometry and the gap configuration which results when the rotors engage with each other also significantly influence the ultimate pressure. Because the dissipated energy that is generated by the pulsing gas flow heats the pump on the outlet side, cooling is required at precisely this location. The gap between housing and rotors is a function of the temperature differential between the warmer rotors and the cooled housing. The amount of heat produced and the temperature are a function of the inlet pressure range. Temperatures are lowest at high inlet pressures (nearly atmospheric), as virtually no compression work is performed here and the displaced air transports sufficient heat out of the pump. In addition, the high gas flow also prevents oscillation of the gas in the last stage. During operation at ultimate pressure (p < 1 hPa), the oscillation of the atmospheric air produces higher temperatures at the outlet area, since no gas is passing through the pump and therefore no heat is being transported out of the pump. 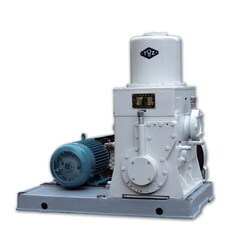 Hepta Dry pumps are dry screw pumps with internal compression. The screw rotors have a symmetrical geometry with variable pitch. These pumps do not have an end plate with control openings; instead, the gas is discharged axially against atmospheric pressure. Because of the internal compression, the volume of pulsing gas is low. This results in lower power consumption, quiet operating, uniform temperature distribution within the pump and low cooling water consumption. This makes these pumps extremely cost-effective, in spite of their robust design. 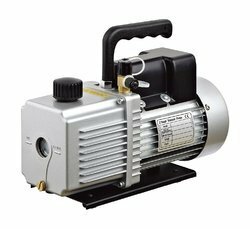 Mechanical booster pumps are used with other roughing vaccum pumps, such as oil rotary pumps, dry vacuum pumps, and water sealed pumps. As the name implies, they are used to “boost” the pumping speed of the roughing pumps within their normal vaccum range.Within the housing of vacuum booster, two pistons rotate synchronously. Thanks to the special profile of the rotating pistons and their precise manufacturing, they do not come into contact with each other or the housing. This makes it possible to pump a medium without the need of any operating fluids. The synchronous rotation of the two pistons is driven by a pair of gear wheels located on the shaft ends in the gearbox and separated from the compression chamber. Vacuum Booster are driven by a directly flanged electric motor of efficiency class IE2. Vacuum Booster work without a mechanical bypass or with mechanical bypass. Without a mechanical bypass, care must be taken that the maximum permissible differential pressure between the inlet and the outlet is kept during vacuum pump operation. In Roots pumps with a bypass valve the differential pressure between the inlet and the outlet is automatically restricted. The optimal solution for clean and dry applications Multi-stage Roots pumps produce clean and dry vacuum for various applications and markets. The technology of the multi-stage Roots pumps is the perfect solution here. Its frictionless working pumping module does not require lubricants and sealing material between the rotor and stator. Thus, hydrocarbon vapor backstreaming can be avoided. In the suction chamber of the pumps, no sealing materials are processed. This means the pumps are free of particles, extremely reliable and stable for a long period of time which results in low costs of ownership. Air-cooled multi-stage Roots pumps have low maintenance and are distinguished through their constant performance. They are used in analytical applications as well as in clean processes for semiconductor production and plasma cleaning. The compact Roots pump can be easily integrated in systems due to their small dimensions. Load locks and transfer chambers from semiconductor and photovoltaic production systems are typical areas of application for this type of pump. The multi-stage Roots pumps with water cooling are produced of robust die cast metal. Just like the Roots vacuum pumping stations, they are used in research and development, vacuum coating and metallurgy when high pumping speed is required. A liquid ring vacuum pump has an impeller with blades attached to a center hub, located in a cylindrical body, but off-set from the center. In Diagram 1A on the right you can see the blades near the top of the pump are closer to the outside wall than at the side of the pump. They are furthest away at the bottom of the pump; you can see this more clearly in Diagram 1B. The impeller sits between two end plates (port plates) which have shaped holes cut into them called ports. The pump requires a liquid (also called the sealant) to create vacuum as follows. Prior to starting the pump, it should be partially filled with the liquid sealant (typically to the center of the body, although this can be plus or minus a couple of inches). The liquid can be water (making it a water ring pump), oil or a solvent, depending upon the application. As you can see in the Diagrams, when the pump is at rest, some of the impeller blades are immersed in the sealant liquid. When the pump starts, the impeller slings the liquid sealant by centrifugal force, to the outside walls of the body, forming a ring of liquid at the outside walls of the body. Because the impeller is off-set from the body, some of the blades are fully immersed in liquid, and some are almost out of the liquid. The area of void space without liquid, is sealed off between the liquid (and hence the term "sealant") and between the impeller blades, called an "impeller cell". As we follow one impeller cell from the top of the pump, counter-clockwise, you can see the liquid recedes from the center hub, acting as a liquid piston to create a larger cell. This is the suction of the pump, drawing in air, gases, or vapors thru the "inlet port" at the sides of the impeller. After impeller cell passes the inlet port and travels toward the discharge port, the sealant liquid is forced back toward the center hub of the impeller, creating the compression step. As the impeller cell passes the discharge port, the compression is at its highest, and the gases, along with some of the liquid sealant are exhausted thru the discharge port to atmosphere. Although the diagrams show a very smooth ring of liquid, in actuality, the liquid sealant is highly turbulent, which is why some of the liquid sealant is discharged with the gases. A two-stage pump is also a much better choice if you are handling solvents at higher vacuum levels (higher than 23"HgV). This has to do with the effect of sealant temperature rise being spread across two stages and its relationship to the sealant vapor pressure in liquid ring vacuum pumps. 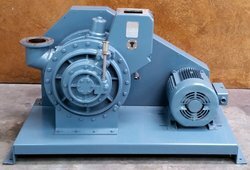 Oil- and contact-free operation claw vacuum pumps have been developed specifically for industrial applications in which constant vacuum, high pumping speed and completely oil-free compression are essential. Claw vacuum pumps operate contact-free; neither oil nor operating fluids are required during compression. Highly efficient The sophisticated claw technology of claw vacuum pumps permits extremely high efficiency levels to be achieved, reducing energy consumption and increasing performance. These vacuum pumps operate contact-free and require almost no maintenance. In practice, this means 60% lower energy and operating costs compared to conventional vacuum generators. They provide oil-free overpressure at up to 2 bar (g) and volume flows of up to 580 m3/h. 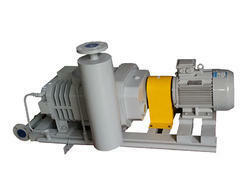 A rotary vane vacuum pump is an oil-sealed rotary displacement pump. The pumping system consists of a housing (1), an eccentrically installed rotor (2), vanes (3) that move radially under centrifugal and resilient forces and the inlet and outlet (4). The inlet valve, if available, is designed as a vacuum safety valve that is always open during operation. The working chamber (5) is located inside the housing and is restricted by the stator, rotor and the vanes. The eccentrically installed rotor and vanes divide the working chamber into two separate compartments with variable volumes. As the rotor turns, gas flows into the enlarging suction chamber until it is sealed off by the second vane. The enclosed gas is then compressed until the outlet valve opens against atmospheric pressure. The outlet valve is oil-sealed. When the valve is open, a small amount of oil enters the suction chamber and not only lubricates it but also seals the vanes against the housing (stator). In the case of gas ballast operation, a hole to the outside is opened, which empties into the sealed suction chamber on the front side. As a result, the pressure needed to open the outlet valve is attained at relatively low compression during the compression pumping phase. This allows a displaced gas/vapor mixture to be expelled before the vapor starts to condense. The final pressure reached during operation with gas ballast is higher than in operation without gas ballast. 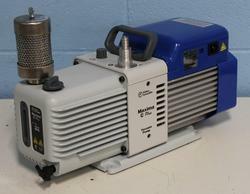 Rotary vane vacuum pumps are built in single- and two-stage versions. Two-stage pumps achieve lower ultimate pressures than single-stage pumps. Moreover, the effects of the gas ballast on the ultimate pressure are lower, as the ballast gas is only admitted at the high pressure stage. 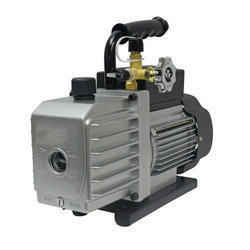 Looking for Vacuum Pump ?